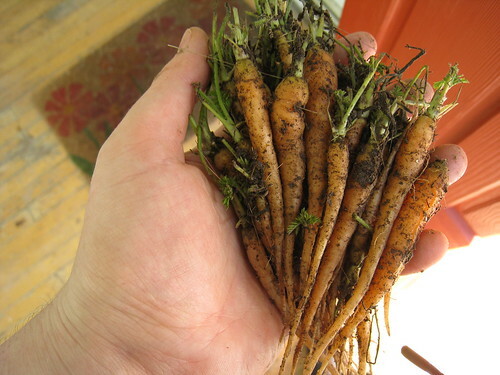 I dug up these carrots while clearing the garden beds for peas. I planted them in late summer hoping for a fall and winter harvest, but the greens were munched by slugs and I didn’t think there would be any root growth at all. Funny what surprises lie under ground. Sadly they tasted like old sticks. This entry was posted on Tuesday, April 6th, 2010 at 11:42 am	and is filed under garden. You can follow any responses to this entry through the RSS 2.0 feed. You can leave a response, or trackback from your own site. lol. not even like “fresh sticks”? Too bad they tasted so unpleasant. They look nice. And how nice to find them there so unexpectedly.